The fractious relationship between India’s cab aggregators and their drivers has hit yet another speed bump. Starting Sunday, thousands of Uber and Ola drivers are going on strike across the country. 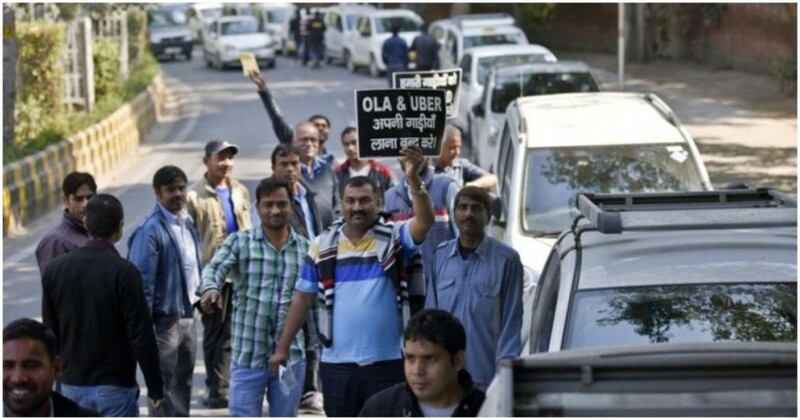 They are demanding guaranteed business worth Rs 1.25 lakh a month, the shutting down of operations of company-owned cabs which eat into their business, and the reinstatement of drivers blacklisted after receiving low ratings from passengers. The strike will reportedly affect New Delhi, Bengaluru and Pune among other cities, but appears to be based out of Mumbai, where it has the backing of the Maharashtra Navnirman Sena. “We have got support from various unions of Ola and Uber across the country and in Mumbai alone the effect will be that around 60,000 cabs will be off road,” an MNS representative said. This isn’t the first time Uber and Ola drivers had gone on strike, but this time their demands appear to be a lot more specific. Drivers are demanding the companies continue providing them the business worth Rs. 1.25 lakh per month that they’d been promised when they’d first signed up to their platforms. During the first few years of their operations, cab aggregators had been true to their word, and, thanks to generous incentives, Uber and Ola drivers were easily making Rs. 80,000 a month or more. This prompted drivers to upgrade their lifestyles — they put their children in better schools, they moved to better homes, and many took loans to buy their own cars. But the party didn’t last long. Once Uber and Ola had enough drivers on the roads, they sharply cut back on incentives. Drivers’ incomes fell, and today Uber and Ola drivers these days barely make Rs. 30,000 a month. Drivers, justifiably, feel hard done — they’re unable to maintain the lifestyles they’d grown accustomed to. Worse, they’re finding it hard to pay back the loans they’d taken to buy their cars. Drivers have made their helplessness known to Uber and Ola in the past — last year, drivers had dressed up as beggars in Hyderabad and asked for alms at traffic signals to highlight their plight, while drivers in Bangalore had thrown stones and broken windows of the Uber office. More tragically, a 34- year driver in Hyderabad had committed suicide after being harassed by loan officials. In Bangalore, a driver had consumed poison, and another Ola driver had set himself on fire. Uber and Ola had followed what’s the usual startup playbook — they’d burned large amounts of money to get users and drivers on their platforms, and once they were popular, they’d decided to cut back on the freebies. But while they were tinkering with their Excel models, they possibly ignored the impact their decisions would have on real lives — the drivers who’d signed up for Uber and Ola weren’t the most savvy, and at times uneducated. They were unable to grasp that the high incomes they’d been earning would be fleeting, and didn’t adequately prepare for the times when their incomes would normalize. Now Uber and Ola must deal with a fleet that’s both dissatisfied, and increasingly desperate. In all probability, the companies won’t have the leeway to increase driver incomes — both Uber and Ola are currently making losses, and will find it hard to pay their drivers substantially better. Indian consumers, for their part, would hope that the companies manage to mollify the drivers and get them back on roads. If they don’t, the only way out for the companies could be to raise cab hailing fares for riders across the country. And that, in turn, could mean the end to the party of low fares that urban Indian cab riders have become used to.